”Among these drawings, which I have chosen with the greatest of care for this exhibition, there are four – portraits perhaps – done from my face as seen in a mirror. I should particularly like to draw these to the visitor’s attention. These drawings seem to sum up observations that I have been making for many years on the characteristics of a drawing, characteristics that do not depend on the exact copying of natural forms, nor on the patient assembling of exact details, but on the profound feeling of the artist before the objects which he has chosen, on which his attention has focussed, and the spirit of which he has penetrated. My convictions on these matters crystallised after I had verified the fact that, for example, in the leaves of a tree – a fig tree, particularly – the great difference of form that exists among them does not keep them from being united by common quality. Fig leaves, whatever fantastic shape they assume, are always unmistakeably fig leaves. I have made the same observation about other growing things: fruit, vegetables, etc. Thus there is an inherent truth which must be disengaged from the outward appearance of the object to be represented. This is the only truth that matters. The four drawings in question are of the same subject, yet the calligraphy of each one of them shows a seeming liberty of line, of contour, and of volume expressed. Indeed, no one of these drawings can be superimposed on another, for all have completely different outlines. In these drawings the upper part of the face is the same, but the lower is completely different. In n. 158 (top, left), it is square and massive; in no. 159 (top, right), it is elongated in comparison with the upper portion; in no.160 (bottom, left), it terminates in a point and in no. 161 (bottom, right), it bears no resemblance to any of the others. Nevertheless, the different elements which go to make up these four drawings give in the same measure the organic makeup of the subject. 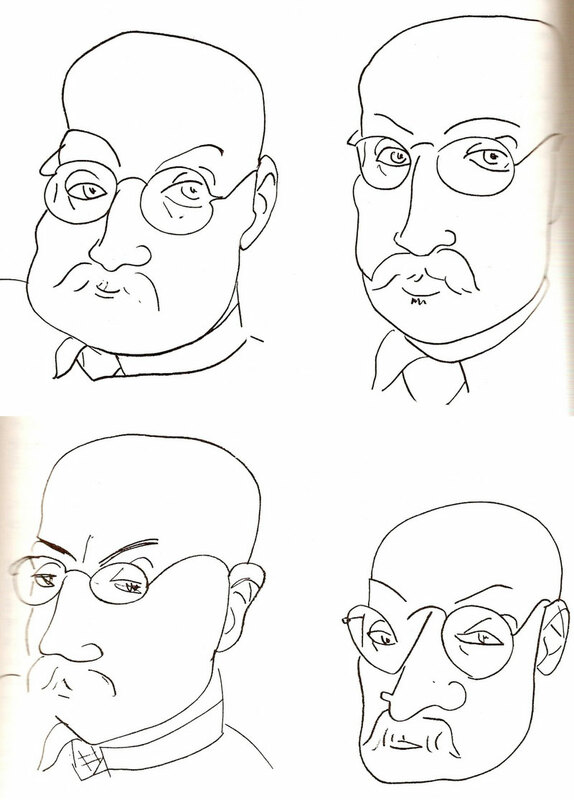 These elements, if they are not always indicated in the same way, are still always wedded in each drawing with the same feeling – the way in which the nose is rooted in the face – the ear screwed into the skull – the lower jaw hung – the way in which the glasses are placed on the nose and ears – the tension of the gaze and its uniform density in all the drawings – even though the shade of expression varies in each one. It is quite clear that this sum total of elements describes the same man, as to his character and his personality, his way of looking at things and his reactions to life, and as to the reserve with which he faces it and which keeps him from uncontrolled surrender to it. It is indeed the same man, one who always remains an attentive spectator of life and of himself. It is thus evident that the anatomical, organic in exactitude in these drawings, has not harmed the expression of the intimate character and inherent truth of the personality, but on the contrary has helped to clarify it.